Barbara M. Handrup, age 88, of Aurora, passed away Thursday, February 8, 2018, at Bryan/LGH Medical Center West in Lincoln. Funeral Services will be held at 10:00 A.M., Tuesday, February 13th at St. John’s Lutheran Church in Kronborg. Rev. Kristine Schroeder will officiate. Interment will be in the St. John’s Lutheran Cemetery. Visitation will be from 5 - 7 P.M. Monday at Higby-McQuiston Mortuary in Aurora. Memorials may be made in care of St. John’s Lutheran Church in Kronborg. Condolences may be e-mailed to the family through the mortuary website at www.higbymortuary.com. 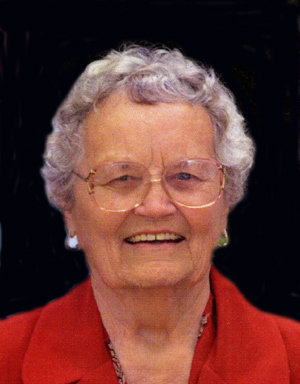 Barbara Mae Handrup, the sixth child of Thomas S. and Clara Marie (Rasmussen) Hermansen, was born at Dannebrog, Nebraska on June 13, 1929 and passed away in Lincoln, Nebraska on February 8, 2018 at the age of 88. Barbara was baptized St. Peder’s Lutheran Church in Nysted, Nebraska. She moved with her family to Texas in 1936, where she received most of her schooling and graduated from Marquette High School in 1946. Barbara attended Grand View College in Des Moines, Iowa and returned to Marquette where she taught school one year. On June 10, 1949, she was united in marriage to Hugo Handrup of Cedar Falls, Iowa. Four children were born to that union: Paula, Barry, Vicki and Kirk. They owned and operated the Kronborg Store from 1951-56. They owned and operated Handrup Shoe Store in Aurora from 1960-73. Hugo passed away on September 19, 1984. Barbara was a very active member of St. John’s Lutheran Church. She served on numerous committees, the council, choir, music and workshops. She enjoyed baking, playing cards, ping pong and her favorite – watching her children and grandchildren in their different sporting events. She enjoyed traveling, which included several trips to Alaska and Denmark. Barbara was proud of her Danish heritage and practiced many of the Danish customs and traditions. She was preceded in death by her parents; husband, Hugo; daughter, Vicki Stuhr, three brothers, Leif, Rex and Kermit Hermansen and three sisters, Selma Sorensen, Alpha Christensen and Shirley Andersen. Those who remain to cherish her memory are her three children, Paula Handrup (Clark Neal) of Goodyear, Arizona, Barry (Ardith) Handrup of Hampton and Kirk (Barb) Handrup of Aurora; 10 grandchildren and 25 great-grandchildren. She is also survived by two sisters-in-law, Charlene Hermansen, Natalie Morgan and a brother-in-law & sister-in-law, Richard & Viola Bruhn and many nieces and nephews and their families.